The Sealed Book of Mormon can now be ordered through Amazon. Mauricio Berger in Brazil testifies that the an angel directed him to meet with Moroni. who delivered to him the Book of Mormon plates. Three other witnesses were also allowed to meet with Moroni. Mauricio, the three witnesses and eight additional witnesses from the United States were all present when the seals were removed from the Book of Mormon. Once the bands that bound most of the plates were removed, they learned that there were two secondary seals. They released the first section of the plates, but the larger portion will not be opened until Christ opens it. On the cover of that last sealed portion is a beautiful embossed cover plate that depicts the return of Zion to the earth were Christ is symbolized as a shepherd. When people heard that the Book of Mormon plates were being translated in Brazil, many people expressed understandable skepticism. There have been other people who have falsely published a translation of the sealed portion of the Book of Mormon. So of course people are not willing to accept these claims without evidence that these really are the gold plates from Moroni. The one thing that sets this record apart from those who created fraudulent sealed portions is the fact that multiple witnesses are available to testify about the reality of the events and artifacts. In 2017 Joseph Frederick Smith (a great grandson of Joseph Smith Jr.) received the following email from Mauricio Berger in Brazil. I have a lot to say Mr. Smith, but as I do not know how to speak or write in English, I fear that the Google translator will transcribe a phrase otherwise, causing confusion that can be read by you. So I will briefly summarize the facts so that you can keep track of what happened to us and what we want with you. I do not understand all of your scriptures, your doctrines, but I will use the Bible and the text of your scriptures as it appears in the site www.centerplace.org. It all started April the 6th, 2007. It was the eve of Easter. I had climbed a hill alone to pray to God in the desire to get some answers to my questions. During the trip I was lost in the woods, closed until sunset. And night came and the darkness of the trees was larger than in an enclosed room. And without a flashlight, I could not move from that place. Fear at that time took over my senses making me feel like a dark force was overwhelming me. The being who was waiting for me at the top of the mountain then prescribed more than once the text of Isaiah 1:2-9, so that it was etched in my memory. He told me that he appeared to me because of my great faith and restlessness. And that my prayer had touched the feelings of Him that rules the whole universe. But he required me to return to that same place no longer alone, but accompanied by three other men who had approached me for Bible study and that we should go back there every year until 10 years had past. And so we did, until we came to understand what God expects us to do. You contact was revealed to us in this last time, which was January 21st of this year 2017. We were told on this occasion that we went up the hill, that the Lord was moving his hand to restore Zion to it’s place determined by him, in a place chosen to be the New Jerusalem in Missouri. He said that the churches that bear his name had strayed from their covenant making the arm of flesh their strength. He showed us that the Remnant quoted by him the first time in Isaiah 1:2-9 referred to the branches of the Restoration. In relation to what the Lord requires of us with you is that a congregation directed by you in Brazil be established and be in commune with the other branches of the restoration, because the Holy Spirit will operate in our midst, entering and preaching in many chapels of the Church of Jesus Christ of Latter-day Saints. For there are many people in that denomination that the Lord intends to seek for Himself as he did in the past when the Nephites preached to the Lamanites. Our work therefor is similar to that of Alma who preached among the wicked people of King Noah. Converting his members to the truth of the gospel of Jesus Christ. The Lord allowed the powers of darkness to take over the regency of the greatest church of the saints of today. But he intends to seek his own sheep from this flock, so that the prophecy of Isaiah 60:22 will come. What we initially desire is the baptism of your hand or an authority sent to us from you for this purpose and obtain the Gift of the Holy Ghost, in order to fulfill our ministry fully as promised to us by the heavenly beings. We are willing to separate our tithes from now on to achieve this goal, which is not ours only, but of our Lord Jesus Christ. We were told that you would be our leader as long as you lived. By the power and mercy of our Heavenly Father and our Master and Redeemer, yes, Jesus Christ, we bear our witness to all nations. After some time with Mauricio Berger, who told us about the events on Mount Agudo, we decided to accompany him to the mountain. We can say that everything we have seen there has an extraordinarily sacred character. The prayers and praises offered to the Lord in that place, seeking to do the will of the Father, resulted in the visit of celestial beings; the instructions received directly from the Angel Moroni, are events that have marked our lives forever and ever. We squeezed his hand and received from him the Golden Plates, the translating stones and the Sword of Laban, formerly in possession of the Prophet Joseph Smith Jr. This sublime circumstance had a powerful effect on our beliefs by enlarging our perception of this great and marvelous work. We affirm that, by the power of God, the Sealed Book of Mormon will be translated, contained in the plates. We know, therefore, that the translation will take place in two time periods. The first part that belongs to Maurício Berger (in fulfillment of the prophecy of 2 Nephi 27: 21-26 LDS, or even 2 Nephi 11: 143-147 RLDS), with the intention of calling His people again to repentance. Upon completion of the translation, we understand that will be fulfilled what is written in 2 Nephi 30: 3 LDS, or 2 Nephi 12:80 RLDS – where it is clear this Record will be sealed back to the Lord in accordance with Ether 4: 7 LDS or Ether 1: 101 RLDS. Qualifying your people to receive the second part. We place our witness at the disposal of the world, with a deep sense of gratitude and a total sense of responsibility towards God who directs this work. We solemnly affirm that by our fidelity to this testimony our garments will be clean at the last day. In vain will be the one who stands up against the work of God. Honor and glory be for ever and ever, the Father, his son Jesus Christ and the Holy Spirit, in whom we entrust the conclusion of this glorious work. Amen. We declare in the name of Jesus Christ that on Sunday, March 4, 2018, Maurício Artur Berger, the translator of the first part of the sealed plates, showed to us the golden plates which are covered on both sides with fine engravings; that we held the plates and turned the pages; and we closely examined the plates, which have the appearance of gold, and are bound together by three rings, which are silver in appearance; and we examined the characters thereon, which are exceeding fine and intricately engraved. By our examination and the confirmation of the Holy Spirit we have the assurance that they are the plates of Mormon. And we give our names unto the world, to witness unto the world that which we did both behold and handle before each other, as God bears this our witness. We beheld and handled the interpreters, by which these engravings will be translated by the gift and power of God. We further declare that in our presence the seals were removed which had tightly bound the greater portion of the plates. We beheld and examined the plates that were newly loosed, which have an exceeding luster with indented engravings. Further, we bear record that the more part of all the plates remain sealed and are to come forth by the will of Jesus Christ in his own due time, and that we beheld and marveled to see the exquisite cover of the sealed book, that depicts upon the entire plate a carefully crafted and intricate image of the promised return of the heavenly city Zion, and that these things are to remain sealed until they are revealed by Christ to his people when they are prepared and found worthy. We admonish all nations, kindreds, tongues and people to repent and come unto Christ and heed the words which he gives, that your souls may be found spotless at the last day. On April 29, 2018 I had the opportunity to meet with 5 of the witnesses (Bob Moore, Brad Gault, Gary Metzger, Tyler Crowell and David Gilmore). Later on June 8th I was able to meet with 2 additional witnesses (Joseph F. Smith, Same Gould) and the 13th witness. My purpose in meeting with them was to ask them questions, feel of their spirits, examine pictures and get a personal perspective on what they had witnessed. Many of these witnesses did not know each other before the trip. They were apprehensive about what they would see and they wanted to be sure to detect any deception in the plates or deceit by Mauricio or others. They observed that Mauricio was completely open to any questions or requests. He was unafraid to let them know about his mistakes and gave them complete access to the plates. These witnesses went to Brazil with some apprehension and they didn't leave until they had fully satisfied themselves that there was no deception with the plates. Sam Gould had been particularly interested in verifying that the metallurgy was consistent with Moroni's time period. When the rings were fully exposed, he was able to verify that they were fused in a manner that was appropriate for the time they were created. Each witness had a different experience with the plates and the Brazilian witnesses. Tyler Crowell had been promised in a patriarchal blessing in 1986, "having the privilege of turning the sealed portion of the Book of Mormon." Tyler was allowed to sit with the plates for an extended period of time where he turned page after page of the plates and examine the characters on each plate. I testify that these witnesses are honest men who have made a diligent effort to know the truth about these plates and that not only have they been satisfied with what they learned, but they also felt a witness of the Spirit that this is the work of the Lord. They went to Brazil as individuals, but they returned united in the Spirit, with a bond of love, prepared to publish to the world their testimony. There will always be critics of this work. Remember, "faith is not to have a perfect knowledge of things" (Alma 32:21). Therefor it is always possible to not be fully convinced. But we must take the assurances that we have from these witnesses and step forward in faith to accept what the Lord is providing for us in this day. All the evidence that I have, indicates to me that Moroni has entrusted Mauricio with the ancient Book of Mormon record. I praise God that I will soon have the opportunity to read what the Lord wants revealed in this day. The sealed record will be the main test of the validity of these claims. Interestingly, now that we have the record and it has been published, it does not generate a lot of confidence. Expectations are high about what this record would contain and the portion that is published at this time (April 2019) are not very exciting. As quoted below, Mauricio explains that we will get more when we can show that we can live what is contained here. There are been several attempts to discredit these plates from Brazil. One of the more extensive discussions come from Price Publishing Company. The latest version of their analysis is dated, May 29th, 2018. There is no way that I can refute all their claims because I don't have the plates or sword for a complete analysis. But I believe that I can present enough information so that you can have a desire to approach the Lord and get an answer about these events and artifacts. There is "One Who is Watching" who publishes a blog and he has made several comments about these plates. He was active in his analysis of Mauricio very early. He has a detailed analysis of the Brazil plates from both a scriptural and physical perspective. Denver Snuffer had a blog post where he called the Brazilian plates Bogus. Here is my response to the points that Denver raised. Denver also met with Joseph F. Smith, Sam Gould, Eugene Richardson and a few others on June 9th at his office. Here is a transcript of that meeting. I want to hear, read and test the product that gives the light and the truth more than the artifact that purports to be it. . . . And when the work comes forth, I want to see it. 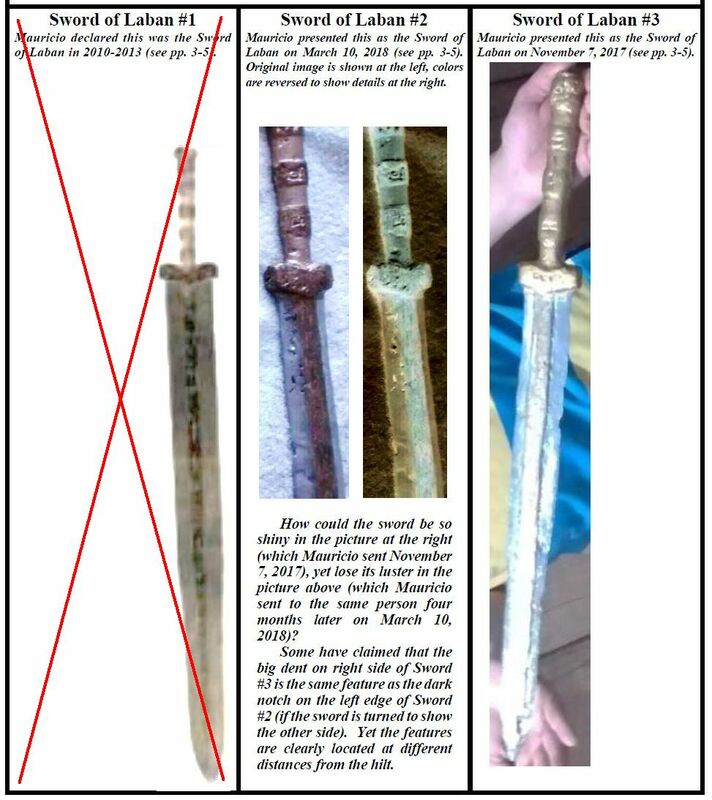 Three pictures of swords are shown by the critics with the claim that they all came from Mauricio and are not the same. In reality there are not three swords. #1 was never a picture from Brazil and #2 and #3 are simply different pictures of the same sword. Sword #1 Mauricio sent an email which mentioned an attached picture of the sword. But he forgot to attach the picture. It is unknown where this picture came from, but none of Mauricio's pictures have a white background. Sword #2 and Sword #3 are exactly the same sword. Sword #2 is a cropped picture that only shows part of the sword with normal and reversed colors. Featured are three documents—one apparently created by John Whitmer, one penned by Oliver Cowdery, and one published as a broadside by a church-affiliated newspaper—that claim to include copies of characters JS transcribed from the gold plates. Although it is unlikely that JS was involved directly in the creation of any of these “characters documents,” each may have derived from a text JS created. Since none of the three documents can be verified as copies of a specific JS document, they are included in an appendix to this volume rather than as featured texts. Hofmann tells us that he added additional flourishes to some of the characters so that it would appear that his was the original document. Q. You mentioned just a minute ago you talked about you wanted to make some changes from the characters that were in the Whitmer Transcript. What was your idea and why did you go about it that way? A. Well, I wanted it to look like it preceded the other transcripts. In other words, the other transcripts were copied from this one or specifically the Whitmer Transcript. I wanted the chronology, I believe to appear that the Whitmer Transcript, as you call it, came from this copy. I think I made it appear as though the Broadside version and the copy, I believe it was in the newspaper, called the Prophet, came from not the Whitmer copy or my copy but another copy that is unknown which originated from my copy. I believe I tried to make it so that the Whitmer Transcript came directly from my copy as far as the detailed changes or whatever. Q. How did you go about deciding what to do as far as making changes in each specific character? A. In some of the characters I added details which did not appear in the others. The way they trace the chronology of that sort of thing and in fact, I had just recently read a book where they were trying to establish the different versions of some of the Shakespeare works and it can be done scientifically as far as details that one has that the other doesn't. And if the details appear to be mistakes in transcribing or if they seem to flow with the natural rhythm of the character or whatever, that's what I was trying to do. Q. Did you blow it up? How were you able to focus in on each character? Q. And basically once again, because I'm still a little confused, to show your document preceded the other one, what did you do as far as the characters? A. For one thing, I added more detail. I also added spacing. Q. Are these things you were thinking of, at the time you were deliberately doing? A. Yes, I was purposely adding detail to make it look as though this preceded the Whitmer rather than vice verse. The Brazil plates have some of the characters from the Hofmann forgery that do not appear in the "Caractors" document. That would seem to imply that the Brazil plates are copied from Hofmann's forgery. However, the plates DO NOT HAVE the extra detail that Hofmann added. If they were actually copying Hofmann, they would have included the things that Hofmann added. So why are there characters on Hofmann that matches the plates. The only reasonable explanation is that Hofmann had access to an unknown document that was actually much closer to what Martin Harris actually took to professor Anthon. There are many other documents that have copies of the characters. We have the Whitmer "Caractors" document, 1844 Placard Stick of Joseph/The Prophet, Eva Grace Print and I am sure there are others. Hofmann implied that there were others when he mentioned, "another copy that is unknown which originated from my copy." The evidence seems to support the idea that there is another copy that Hofmann used as his source. That is why the plates match characters on the plates but do not match the extra details that he added. I will now request that those who are given to prayer please pray for Joseph F. Smith, Mauricio Berger, the 3 witnesses (Valdeci Machado, Joni Batista, and Wagner Zeppenfeld) and the 8 witnesses (Joseph F. Smith, Bob Moore, Samuel S. Gould, Brad Gault, Gary Metzger, Tyler Crowell, David Gilmore, Kelvin Henson) and their respective families, as well as the branches of the Restoration in Missouri, Utah and elsewhere. When I gave Joe that hug, I felt a “potential” for a future event that disturbed me. I saw evil men scheming against him, and making attempts against his life. Not sure that proves him as a prophet, but either way, I choose to pray for the man, and for whatever responsibilities the Lord has called him to bear. Maybe the whole point of me sharing this whole thing is for this prayer request to go out and be answered by those who feel led to. Either way, prayer is needed. The Lord is moving mightily. We can safely assume opposition in equal measure will ensue. Prayer is always needed. It is important to understand that the 8 witnesses that went to Brazil went down there with the critic's comments heavy on their minds. They knew about why the critics were rejecting the idea that the Book of Mormon plates could be in Brazil. So they had some doubt and uncertainty. But they were willing to make the journey and examine the evidence that was available. They were guarding against fraud as much as is possible. But even though they were skeptical, they all came back with a powerful witness that Mauricio Berger does have the real plates of the Book of Mormon. They also had powerful spiritual experiences that accompanied their investigations--speaking in tongues, interpretation of tongues, dreams, prophecy, baptism of fire, etc. So now we now we have 12 witnesses (Mauricio, 3 witness, 8 witnesses) that bear their testimony of the truthfulness of the plates and these events. We will soon have a translation of the sealed portion that we can read and then approach God for our own confirmation, if we have not already obtained that assurance. Eugene Paul Richardson is another witness He was able to witness Mauricio being visited by Raphael and Moroni. However he wasn't allowed to talk about it until now. The Sealed Book of Mormon is a translation from 19 plates that are part of 42 plates that are now unsealed. A couple books that are part of the other 23 plates includes: Prophecies of Samuel the Lamanite and 1/3 of the Revelations of John. The translator, Mauricio Berger, says that we will receive the rest of this sealed portion, "when the people of the church are living in accordance with these first teachings." This book, published at this time includes three books, 1-Words of Moroni, 2-The Sealed Book of Moses, and 3-Acts of the Three Nephites. In the The Words of Moroni, we learn a little more about the life of Lehi and his birth name of Elasah. 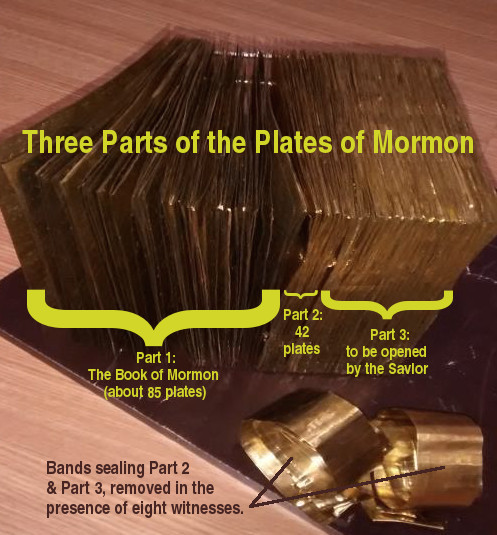 Moroni also mentions the larger sealed portion of the plates that are currently still sealed. The largest of the books now published is The Sealed Book of Moses at over 130 pages. It gives more details about Satan and the mischief with Cain, also info about Enoch and Noah. The last book, Acts of the Three Nephites, doesn't read like Acts in the Bible. It is more of an overview written by one of the Three Nephites - Jonah, "one of the sons of Nephi, who had been chosen by Jesus to be the chief disciple of the twelve whom He called" (Words of Moroni 1:36). The last chapter where Christ explains the Allegory of the Tame and Wild Olive Trees is very interesting. The Book of Mormon was first translated into English, which was the language spoken by Joseph Smith. 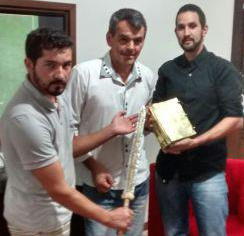 However the translator of this Sealed Book of Mormon is Mauricio Berger, from Brazil. Mauricio's primary language is Portuguese. Although Mauricio had English scribes, there are several times in this text that it is obvious that English is not the primary language used. Hopefully a 2nd edition will be created that will be more readable for the English audience.